Hombre Beef Jerky goes back to 1959 when Thomas Pyle founded the Pyle Meat Company in founded Pyle Meat Company in Eudora, KS, a small community nestled between Lawrence, KS and the KC Metro area. In 1982, Pyle added "Hombre Beef Jerky" to his product line up. When he retired in 2010, both the meat company and Hombre Beef Jerky went offline. However in 2014, his son Joe and grandson Andrew relaunched the Hombre brand in the same area under the company name, Pyle Meat Products. The response has since been phenomenal. Hombre Beef Jerky now retails in over 500 outlets and looks to double that by 2017. Interestingly, the brand won Grand Champion Beef Jerky in 2015 & 2016 at the Kansas Meat Processors Association. Hombre offers two varieties at this time, this "Premium Beef Jerky", and "Jerky Sticks", which we'll review later. The first flavor I pick up is salt, followed by a light smokiness. A touch of black pepper starts to come in. The chewing brings on an increased salt, and a savory mixture of soy sauce and seasonings. There's a light natural meat flavor later in the chewing. Also, the black pepper increases. 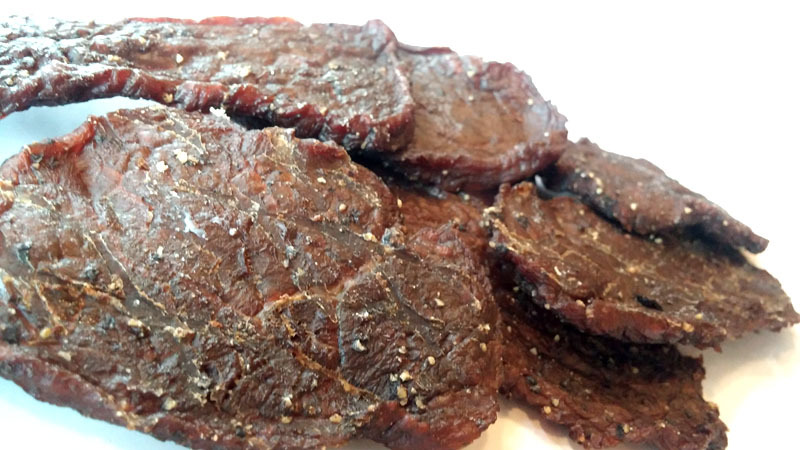 Considering this jerky has a manly namesake, it certainly has a macho flavor that cattle-rustlin' cowpoke needs to register itself across tastebuds worn down from years of tobacco chew and fire water. This is not a jerky to take lightly, and one that could knock a city-slicker off his horse if he ain't hanging on. Otherwise, the primary taste profile is that of salt, with a savory flavoring of soy sauce and onion, and spiced up with black pepper. It's very much an old fashioned style that deals out a light natural meat flavor, but with a good deal of fixin's. The meat consistency is excellent. What appears to be slices of round cut against the grain, it retains a great balance between tender and chewy. It chews and feels like real steak. I see some streaks of fat normal for slices of round, but nothing unchewable or stringy. It's very meaty. 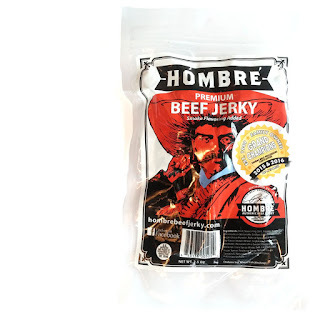 Hombre Beef Jerky is definitely a more rugged, old fashioned style with a manly flavor of salt, pepper, and seasonings. Each piece feels meaty, and each piece chews like real slices of steak. It's chewy but not tough, yet tender but not moist. 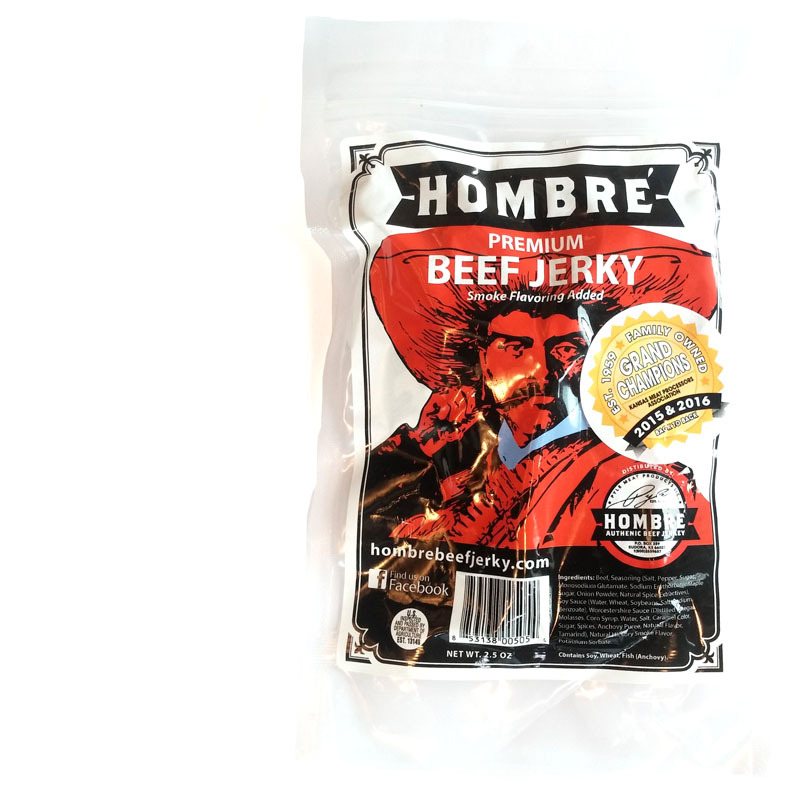 Even though it's simple in flavor and style, Hombre Beef Jerky does a great job of delivering its concept of something rugged and manly. If you don't like salty jerky, this is probably not for you. 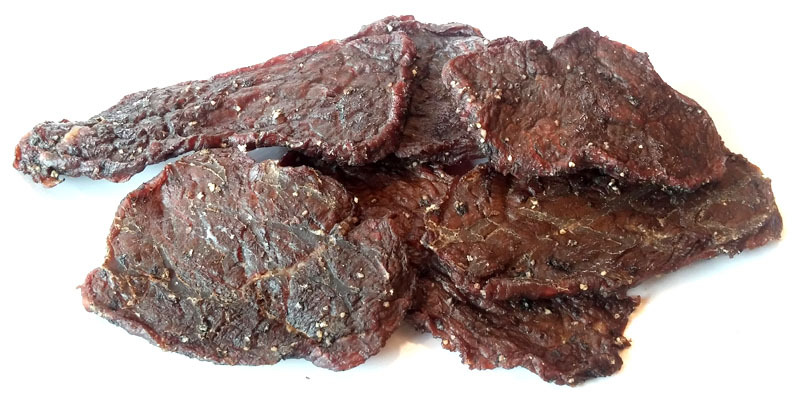 But if you like your steak simple and seasoned, without all the fancy toppings, this is a great jerky for you.